Now this week it really had been a fairly quiet week in our house. A certain little Miss has been an absolute nightmare in terms of sleeping recently so I have not felt like doing much at all. 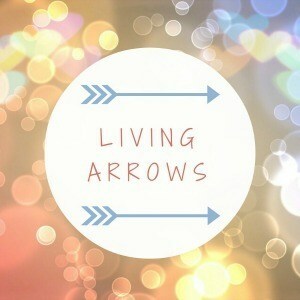 Read on to find out what this week has been like for us in this week’s Living Arrows. For the last week or two now Isla has not wanted to go to sleep at all. Nap times have only happened if we’ve been out in the car and she falls asleep on the way back from somewhere. Bedtime? Oh my word! It is a good job we love her and she is super cute, otherwise I think I might have left her on the church doorstep by now! There have been nights when were put her down for bed at 8:30pm (her normal bedtime) and she has still been awake and running around her cot/ chatting away to herself/ screaming cos she’s so tired but will not go to sleep, at 10:30!!! On numerous nights we’ve had to resort to taking her out for a drive in order to get her to sleep. We then had two good nights where it took 15 and 25 minutes for her to fall asleep… and then back to over an hour for her to go to sleep! I honestly don’t even know what to do anymore, so if you have any suggestions, please, please send them our way! Isla had a little bit of a cold at the start of the week, which she gave to me too. But thankfully it didn’t seem to be one that lasted more than a couple of days for either of us, but I still felt like poo. Isla has had THREE new teeth come through in the last couple of weeks, which may be part of the reason she hasn’t been sleeping great. But they don’t seem to bother her too much. She chews on her fingers a lot, but doesn’t appear to be in any sort of pain at all, which is good. We went to Odd’s Farm again on Thursday. I’m making the most of my membership! Isla got so excited when she realised where we were when we walked through the main doors. She ran around like a loon for 3 hours in the soft play bit, and then we went for a quick look at the animals (well we were at a farm after all!) Isla loves goats so we went to see them, but she wasn’t so keen when one started to lick her pushchair! She was super brave though, and stroked the bunnies, and kept going back for more! 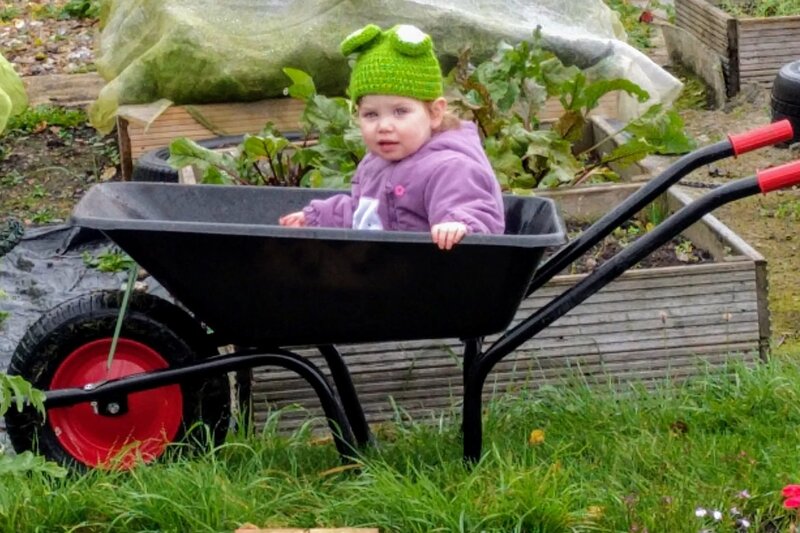 One of us (usually Chris) ends up taking her round all the plots in the wheelbarrow, pretending she’s on a train. She stops at lots of different stations – Sweetcorn City, Potato Street, Dahlia Road, Tap Town, Compost Central. She loves it! I think she looks super cute in the hat she is wearing in this photo. I have a gorgeous photo of her wearing it last year when she was teeny tiny, which I will post on my Instagram, Facebook and Twitter accounts if you wanted to see how much she has changed, but still looks just as cute! I think it’s pretty much the last time she will wear it as its a bit small for her now and doesn’t cover her ears anymore! We also went swimming at the weekend, and Isla absolutely loved it! I think it helped that we went before she got too tired, and it wasn’t too busy when we were there either. It’s only the third time we’ve been swimming since our lessons got cancelled at Easter, and I was so impressed that she remembered how to do her kicking, and she was really good with going under water too. So that was our fairly quiet week. I’m hoping her sleep might improve a bit before we go on holiday to St Ives at the end of the week. And also that my car passes it’s MOT on Thursday, otherwise our journey down to Cornwall might not be quite as comfortable if we have to go in Chris’s car!